We are Exporter, Manufacturer and Wholesaler of Wooden Handicrafts. We unfurl our splendid range of wooden handicrafts that are designed in accordance with the needs and wants of our clients. We believe in customer satisfaction. We majorily supply in India, USA, Australia, Dubai, Malasiya, UK, France, Europe etc. We offer Wood Elephant. It has been made in Antique pattern, which looks very different and attractive. It is very good for decoration at your home. Our firm specializes in providing a quality array of Marble Antique Jars. These jars are made using premier quality raw material and are decorated with beautiful deigns. Applicable for decorating the interior of hotels, restaurants and homes, these are available in various sizes. Our clients can purchase these from at affordable price range along with customizes service options. Our firm specializes in providing a quality array of Wooden Finework Horse. These jars are made using premier quality raw material and are decorated with beautiful deigns. Applicable for decorating the interior of hotels, restaurants and homes, these are available in various sizes. 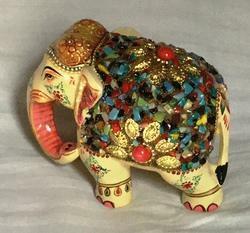 Our firm specializes in providing a quality array ofWooden Elephant 4x5"size With Multi Color Stones. Applicable for decorating the interior of hotels, restaurants and homes, these are available in various sizes. Our clients can purchase these from at affordable price range along with customizes service options. Well known manufacturer, supplier & exporter of Wooden Ganesha Playing Instruments. We manufacture these products by using the high grade of raw material. These can be placed anywhere according to the need of the customers. These are available in different shapes, sizes and designs to match up the growing demand of the users. These are procured from reliable vendors who are well known in this field. 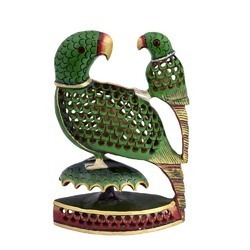 We are one of the well known manufacturers, suppliers and exporters of Wooden Dancing Peacock. 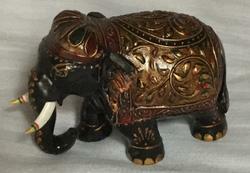 We offer Wooden Antique Elephant. It has been made in Antique pattorn, which looks very different and attractive. It is very good for decoration at your home. Packaging Details: We pack in Bubble sheet nicely which is very safe in transportation. We are exporter, supplier of tea coasters which includes wooden tea coaster, decorative wooden tea coaster, and gift purpose tea coaster. There are six set coasters in fancy elephant design paatern on it. "We are looking queries from USA, Australia, Dubai, Malasiya, UK region." 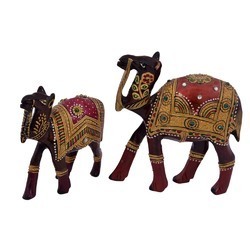 We are one of the well known manufacturers, suppliers and exporters of Wooden Elephant. 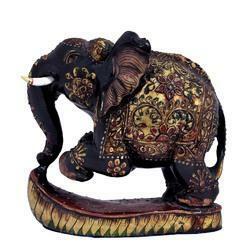 We are one of the well known manufacturers, suppliers and exporters of Wooden Elephant With Metal Net sticked on it. This is 8" size Wooden Elephant with up trunk. 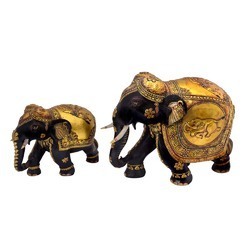 We are one of the well known manufacturers, suppliers and exporters of Gold Plated Wooden Elephant . This is 8" size Wooden Elephant with up trunk. The gold plated elephant looks nice in your house. We offer Wood Elephant with Ambabari. It has been made in Antique pattorn, which looks very different and attractive. It is very good for decoration at your home. 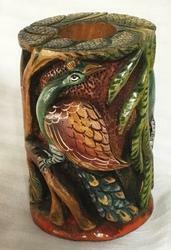 We manufacture Wooden Peacock. It is 5"size. This dancing Peacock looks beautiful when it's all feathers are opened. It can be placed in any room of the house to give your hear a good feeling. Peacock is always adorable. We are proud of our national bird. 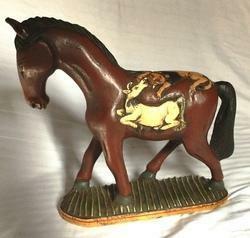 Our firm specializes in providing a quality array of Wooden Horse. It is 12" size in height. There are hunting scene on both the side of this stylish Horse. The Horse is standing on a wooden base. It is nice to decor in your house. 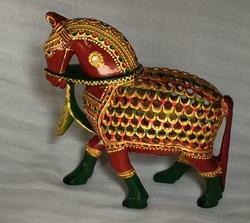 We are well known manufacturer, supplier & exporter ofWooden Fine make Horse. We manufacture these products by using the high grade of raw material. These can be placed anywhere according to the need of the customers to decor your place. These are available in different shapes, sizes and designs to match up the growing demand of the users. 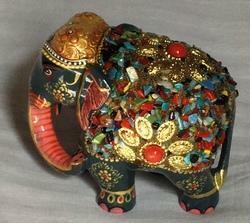 We are one of the well known manufacturers, suppliers and exporters of Wooden Elelphant with Multi Stones. With the utilization of superior quality raw materials and contemporary techniques we manufacture these elephants. 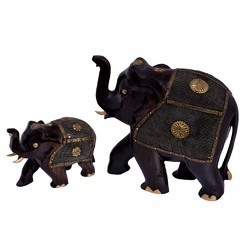 Available in various sizes these elephants are used for the decoration purpose. We offer these elephants to our customers at affordable price range. 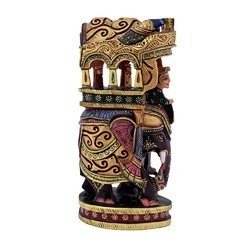 We offer wooden elephant with base. It has been made in Antique pattorn, which looks very different and attractive. It is very good for decoration at your home. We offer wooden camel set. It has been made in Antique pattorn, which looks very different and attractive. It is very good for decoration at your home. 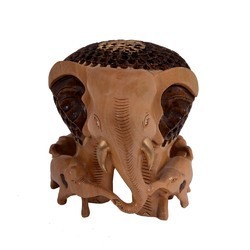 We offer Jalidaar Wood Elephant with it's family around it . It has been made in Antique pattorn, which looks very different and attractive. It is very good for decoration at your home. 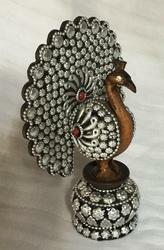 We offer wooden peacock set. It has been made in Antique pattorn, which looks very different and attractive. It is very good for decoration at your home. 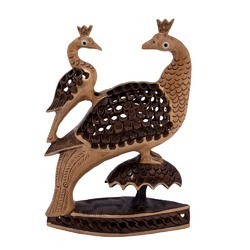 We offer Wooden Peacock Set. It has been made in Antique pattern, which looks very different and attractive. It is very good for decoration at your home.